Dr. Leonard Horowitz (DMD, MA, MPH, DNM, DMM) is an internationally- known award-winning author, film-maker, and music producer whose most recent works have accelerated the Spiritual Renaissance by prompting the "528LOVERevolution" throughout the music industry and natural healing communities. A Harvard-certified authority in public health, emerging diseases, and natural healing, Dr. Horowitz is globally known as the best credentialed, most outspoken, critic of "modern medicine" and the drug cartel, and a pioneer in natural healing using the most powerful sound and light frequencies celebrated throughout nature. In 1999, he was voted "Author of the Year" by the World Natural Health Organization for his first of three national bestsellers, Emerging Viruses: AIDS & Ebola—Nature, Accident or Intentional? In 2006, he was honored by the World Organization for Natural Medicine as a "World Leading Intellectual." Later that year, he was knighted for his works in health education, natural healing, vaccine risk awareness, and ministry medicine by The Sovereign Order of the Orthodox Knights Hospitaller of Saint John of Jerusalem. Dr. Horowitz’s presentations and publications have served as the impetus for numerous Hollywood films. His book, LOVE the Real Da Vinci CODE, was made into a 2-hour DVD documentary called The LOVE CODE. It presents the musical-mathematics underlying the spiritual mechanics of The Secret (DVD documentary). His “Perfect Circle of Sound™” revelations have been revolutionizing the music industry as well as water science. In his most recent book, The Book of 528: Prosperity Key of LOVE, Dr. Horowitz revealed that the 528Hz frequency is the pure tone of LOVE, and 528nm is pure "LOVE light." Dr. Horowitz oversees the Creator's Rainbow Spa on the Big Island of Hawaii, boasting Hawaii's only lava-heated natural steam saunas and geothermal warm pools, in which he applies, and studies, the powerful healing affects of this paradigm-shifting musical knowledge. Dr. Horowitz’s websites include: www.DrLenHorowitz.com, www.HealthyWorldAffiliates.com, www.HealthyWorldStore.com, www.TheBookOf528.com, and 528Records.com. "So far a Nobel Prize hasn't been awarded to Dr. Len Horowitz, but it should have been,... he relays some of the most provocative and important information in the world today." "In my estimation Dr. Horowitz has unearthed a covert operation run amok, that is bigger than any secret operation in U.S. history, and more momentous in it's implications to humanity than the atomic weapons 'Manhattan Project' of World War II." A Harvard University trained expert in health education and media persuasion, he has additional expertise in genetics and electrogenetics, virology, and vaccine research and development, by reason of his academic trainings, scientific publications, sixteen published books, and internationally recognized authority in these fields. Over the past 30 years he has become a best selling author, personal care educator, consumer protector, alternative and complementary care specialist, and by far healthcare's most controversial critic of the pharmaceutical cartel, especially following the release of his second documentary film, In Lies We Trust: The CIA, Hollywood, and Bioterrorism. His celebrity has expanded internationally making him the second most popular alternative healthcare professional on YouTube, following Depak Chopra, despite frequenty reported suppression of his information and reduction of registered views and viewer ratings. Dr. Horowitz has formulated, or co-created, numerous natural remedies for public protection and remediation of diseases; and holds trademarks covering several products that compete powerfully with the drug industry’s monopoly over infectious disease prevention and remediation. In this "Age of the Great Plagues," the doctor's most important advancement is the 528Hz frequency resonating silver hydrosol called OxySilver, that Dr. Horowitz describes as "a combination of God/Water, LOVE/528Hz energy, and superconducting nanosilver bonded to oxygen." He predicts OxySilver will put BigPharma out of business as people learn how simply and powerfully this mineral Water works energetically, "especially when coupled with heart-felt loving, faithful, and prayerful intention, to heal virtually every physical or chemical malady ailing humanity." As you might expect from his biospiritual orientation, Dr. Horowitz is a Levitical priest by virtue of his bloodline, spiritual direction, and ecclesiastical commitments. He is the body corporate and Overseer of The Royal Bloodline of David, an omni-denominational healing ministry. In 1999, Dr. Horowitz was voted "Author of the Year" by the World Natural Health Organization for his first national bestseller, Emerging Viruses: AIDS & Ebola—Nature, Accident or Intentional? In 2006, he was honored by the World Organization for Natural Medicine as a "World Leading Intellectual." Later that year, he was honored for his global efforts to advance public health and vaccine risk awareness by officials of The Sovereign Order of the Orthodox Knights Hospitaller of Saint John of Jerusalem. Dr. Horowitz received his doctorate from Tufts University School of Dental Medicine in 1977. As a student and faculty member at Tufts, he taught medical and dental histology, graduated with honors, and was awarded a research fellowship in behavioral science at the University of Rochester. He later earned a Master of Public Health degree from Harvard University focused on behavioral science and media persuasion technologies, and a Master of Arts degree in health education/counseling psychology from Beacon College, all before joining the research faculty at Harvard School of Dental Medicine to study psychosocial factors in oral health and disease prevention. While in Boston, he also taught master’s candidates, “Pain, Fear and Stress Management” for Leslie College’s Institute for the Arts and Human Development. For more nearly 30 years he has directed the nonprofit educational publishing company that has evolved into Tetrahedron, LLC. Dr. Horowitz’s published works include dozens of peer-reviewed scientific articles and three American best-sellers: Emerging Viruses: AIDS & Ebola—Nature, Accident or Intentional? (1998), Healing Celebrations: Miraculous Recoveries Through Ancient Scripture, Natural Medicine and Modern Science (2000), and Healing Codes for the Biological Apocalypse (1999) which has permanently expanded the field of musicology. Dr. Horowitz’s second best-seller, Healing Celebrations, provides practical information and advice for prevention, protection, and natural-healing in an age of bioterrorism, “medical-mania,” and man-made plagues. In June, 2001, three months before the terrorist attacks of 9/11, Dr. Horowitz released his prophetically-titled critically-acclaimed book, Death in the Air: Globalism, Terrorism and Toxic Warfare. This book examined leading global industrialists’ successful efforts to direct contemporary culture through propaganda wars, toxicity, petrochemical/pharmaceutical malfeasance and economic dependence, and propaganda methods for fear infliction and new markets’ creation. His 2004 book, DNA: Pirates of the Sacred Spiral, reviewed the science of electrogenetics that speaks to humanity’s fundamental spirituality. Likewise, his early 2006 release, Walk on Water, advances the mathematics, music, and physical mechanics of the ongoing Spiritual Renaissance. This book holds monumental implications for revolutionizing civilization through the science of hydro-creationism. In March of 2007, Dr. Horowitz will release his 16th book entitled, LOVE The Real Da Vinci CODE which amazingly decrypts da Vinci's famous "Vitruvian Man" drawing mapping the mathematical-musical matrix required to accelerate and optimize spiritual evolution for Divine-human communion. Aside from being the Executive Producer of LIVEH2O, an international "Concert for the Living Water" engaging prayerful concers in 76 nations, June 19-21, 2009, Dr. Horowitz led the vaccination prohibition movement beginning April, 2009 following the "Swine Flu" outbreak in Mexico. He developed FLUscam.com, the world's leading alternative news and commentary website including a 24 hour broadcasting station, FLUscam.TV to generate awareness about what governments and health officials were not telling about the suspicous emergence of the man-made H1N1 virus and related conflicting interests in the vaccine industry. Besides an active public speaking schedule, Dr. Horowitz hosts a weekly radio show on BBSRadio.com, stream video over LOVE528TV.net, and oversees The Kingdom of Heaven, a private spa and retreat center on the Big Island of Hawaii, where one of the world’s most powerful natural healing resources—volcanically-heated steam—is being used to help explain and demonstrate Divinity to humanity. For more information about Dr. Horowitz visit his official website at: http://www.drlenhorowitz.com. Sherri Kane is an investigative journalist, news commentator, psycho-social analyst, and political acativist, specializing in uncovering media persuasion and manipulation, conspiracy realities and women's and children's rights issues. She is the Vice President of Medical Veritas Journal, has published work in various newspapers, magazines and websites, and has been interviewed all over the world including Tru Tv's Conspiracy Theory with Jesse Ventura, The Veritas Show, BBC Talk Radio Europe, American Freedom Radio, and other radio and internet broadcasts. 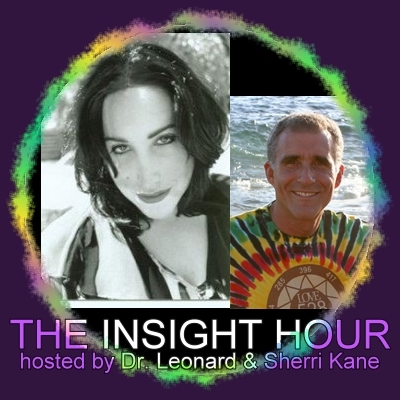 She is the co-host of The Insight Hour on BBSRadio.com along with Dr. Leonard Horowitz. Ms. Kane is currently collaborating with Dr. Leonard Horowitz on various projects including Healthy World Organization (HWO), the alternative to the corrupt World Health Organization (WHO), HealthyWorldAffiliates.com, and advancing the power of the "528 hz" frequency of Love and Healing for a Musical Revolution and Spiritual Renaissance with 528Records.com and i528tunes.com. She most recently wrote the forward to Dr. Horowitz's latest book, "The Book of 528: Prosperity Key of Love"
Sherri co-produced and is co-starring in Dr. Horowitz's latest film, the extremely controversial docu-comedy PHARMAWHORES: The SHOWTIME Sting of Penn & Teller, winner of the 2010 Accolade Award for "Uniqueness in Documentary Filmmaking. "Sherri Kane's story checked out!" "Sherri Kane has an amazing knack for investigative journalism and news commentary inspired by righteous indignation about political corruption and human rights. It has been an honor to work with her on many of the world's most shocking exposés."